Twelve full moons and twelve new ones. Four quarters and four cross-quarters. Birth, life, death and rebirth. Witchcraft is often, though not always, thought about in cycles. From the moment we wake and go to work, to the time we get home, eat, rest and sleep only to wake against the next day, we notice that we live our lives in a cyclic nature. Once we become aware of the subconscious and spiritual, it seems only natural that we would want to apply that to our day-to-day lives. We long for a sense of completion, of wholeness and discipline, and for a chance to evolve seamlessly from path to path as we decide what trajectory we want to take our Craft. While some may find that outside of a daily practice, others crave it. And so we wish to marry that cycle of life and death, of seasons, of moons and stars and planets to our daily mundane. In truth, a daily practice is less cumbersome than you may think. It is surprisingly less elaborate rituals - more walking the walk and talking the talk. Daily witchcraft is about your commitment to your path by integrating your beliefs into your regular life rather than forcing your life to conform to your Craft. The following guide will help you create a routine that fits your lifestyle and avoids burnout. As you follow this guide, you should be mindful of both who you are and what the world around you is like. By blending these, you can find ways your life and Craft merge seamlessly. In fact, you may already have a subconscious daily practice waiting to be brought to light! Sometimes, those who are seeking a daily practice want to totally rework their lives, starting a complicated hour-by-hour schedule of witchcraft and assuming that they'll seamlessly fall into the schedule. True change, however, is subtle and gradual, its staying power reinforced by the way it is effortlessly included in our already present routine. As you follow this guide, be honest and gentle with yourself. 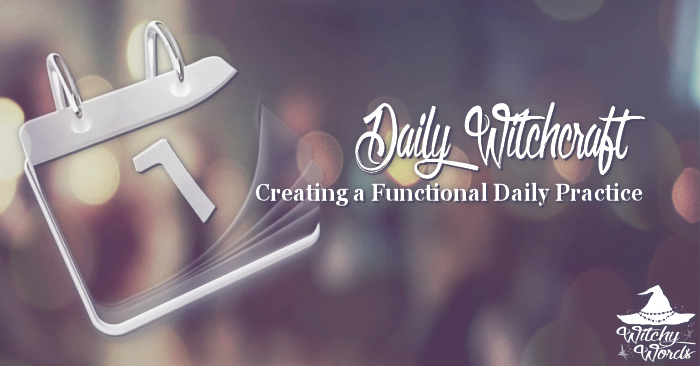 You don't have to be a full-fledged, hat-wearing, wand-waiving witch every single moment of the day. It will not make you any better or more "real" of a witch. Instead, if you're aware of what you want from your practice and what your life can realistically allow - where your strengths and weaknesses lie - your daily practice will essentially create itself! Begin by brainstorming what you want from your Craft. Start at the "End Goal" of where you want to be in a year with your Craft and break it down piece by piece, arriving at the most seemingly mundane steps. Take all your parts into account - your career, your family life, your home and your responsibilities. If you fancy yourself the isolated village witch living in a forest cottage but also want to keep your career in IT and your beautiful family, you might struggle to make the two meet. It's important during this process to be realistic. Identify mundane aspects of your life that have the space for a little magical face-lift. Think about your daily routine. How do you spend your morning? If you often wake up late, rush out the door with barely any, or no, time for breakfast, it's not likely that you'll be able to squeeze a practice into those rushed moments. However, after you come home, if you like to kick off your shoes and relax for a few moments before diving into the next part of your life, you might be able to also squeeze a few moments of the Craft in as well. Consider the parts of your day that are dull, boring, slow even and lacking inspiration - the parts that could use a little magical "spice." Also identify where magic already touches your life. You might be surprised how much you already incorporate your practice into your daily life. Often, once we alter our view from the mundane to the magical, it's difficult to see anything else. Do you enjoy watching the sunset? Do you do a little introspection when you wake up? Where do you get your inspiration now? Is it music? Art? Even a stroll through a witchy Pinterest board can be a way to create a simple daily practice (online altars, anyone?). Choose one five-minute change that you can easily make to your day starting tomorrow. Again, the keyword for this change is simple. You don't want to stress yourself out or find yourself easily forgetting to complete the task. So, instead of trying to cram an hour-long ritual into every sunset that only lasts a few minutes, try instead to so a simple meditation while you feel the warmth of the sun dip over the horizon. Instead of trying to create a website by hand dedicated to your deity of choice, try simply creating a Pinterest board to them and adding to it whenever inspiration strikes as you scroll through on your lunch break. One five-minute change is all it takes to start doing a daily witchy task! Make yourself accountable. Start by requiring just three days a week. Once you regularly hit that quota, up it to five. Mark the days off with a calendar or check in with a friend or network. Give yourself little rewards. You did your sunset meditation every day? Good for you! Have a glass of wine. You have 20 pins on your altar board? Congrats! Now go play your favorite game for a few minutes to take an entertaining break. And if you don't hit your goals, don't sweat it. Go easy on yourself. In fact, if you're struggling to hit your goals, your goals may not be simple or realistic. It may be time to sit down and reanalyze what you can realistically include in your day. Once your daily schedule seems easy, stretch yourself. This doesn't mean adding in that hour-long daily ritual now (or ever). Instead, consider adding something you have to work for just a bit. Add a drum and humming to your regular sunset meditation. Print a picture from your Pinterest shrine and frame it on your nightstand. Add things you collect from around your house or yard to create a small indoor altar. While you want your practice to merge with your life relatively effortlessly, you also want to take chances and step outside of your comfort zone every now and then. Find out what you're capable of. Dare to make mistakes and find your limits. Forgive yourself and scale it back when you go too far. Sprinkle a few simple five-minute tasks throughout your day until you're satisfied. Adding two or three very quick witchy activities to your day can quickly build momentum to your practice. Imagine saying a "thank you" to your nightstand shrine in the morning, adding to your Pinterest altar at lunch and doing a simple sunset meditation in the evening. Suddenly, you have a "breakfast, lunch and dinner" witchcraft trifecta! Once you're satisfied with a schedule, write it down and analyze it. Look back at your initial brainstorming and look forward to where you want to be. Did you achieve it? What's missing? Are you happy with where you're at? Did your path take a totally different direction in the process? What are your new goals? Fine-tune your daily schedule as needed for maximum effect! Take a cleansing and blessed shower. Add ingredients to meals based on their correspondences. Stir liquids clockwise to draw to you and counterclockwise to banish. Choose your clothing and jewelry based on color and gemstone correspondences. Add a scarf and utilize knot magic. Add a playlist of songs that inspire your Craft to your phone for your daily commute or workout. Do some magical crafting (knitting, beadwork, wire-wrapping, candle-dipping or carving, oil creation, etc) while watching TV show or listening to a regular podcast. Greet your deity or spirit every day at the same time. Thank your deity or spirit ever day at the same time. Spend five minutes just talking with your chosen entity. Light a candle on an altar. Offer a simple cup of water. Meditate for five minutes. Ground and center when needed. Be responsible for yourself, taking ownership for your mistakes as well as accomplishments. Give to others: Buy a lunch for a friend, give your change to a fundraiser, and lend a helping hand to a coworker on a project. Cut back on excess energy consumption. Listen to the world around you in a moment of silence. Plant your bare feet in the grass or dirt. Take a walk and feel the breeze. Create a mini-altar with a few natural items you find in your backyard. Read a witchcraft book 15 minutes every night before falling asleep. Get an audiobook to listen to in the car. Choose an area in nature to read about, such as trees, herbs, animals, stones, etc. Watch a YouTube clip on witch history or read a short fairy tale or myth. Draw one tarot card or rune a day, or utilize your pendulum to ask a yes/no question in the morning. Record what happens. Sit with a stone, card, herb or other such took and just feel it for five minutes. Note your experiences. Add a five minute routine that coincides with the current cycle of the moon. Study the astrological components of that day for fifteen minutes and see how they relate. Think about the space between the sabbats and what that means to you. Utilize the magical purposes associated with the days of the week. And these are just a few! As you brainstorm, do some research to see what might fit in with your Craft that's not listed here. Best wishes to you and your new daily practice! I have been focussing on a Witchy Routine myself, as I am the kind of person who functions on a schedule. If I don't have something to aim to, I will lose focus... I believe it is important to bring witchcraft in our daily lives with simple, honest tasks. Thank you for sharing. Thank you so much, Ludna! I absolutely agree. I don't necessarily feel like a daily practice is essential to the Craft - every way of practicing it is valid - but, if it's something you feel you must have, there's some easy ways to go about it. Best wishes to you! This is a good guide, thank you. :) Having a daily practice is an area I struggle with a bit, although I have tried some things in the past. I'm going to think about the areas you suggested. P.S. I especially like the suggestion: "Think about the space between the sabbats and what that means to you." I had actually been thinking about doing some journalling on the time between Litha/Summer Solstice and Lammas. That's a wonderful idea! I'm so glad this article could maybe give you a few more ideas to add to that. Best of luck to you on your journey!